GQP: To print on fabric with my own ink jet printer...actually running quilt fabric through the printer...THAT was the hardest part for me to overcome. Do you have any words of wisdom to help others get over that obstacle? Linda Franz: This is a good point. Many quilters have printed labels or photos on fabric (or know someone who has), but for others, it just doesn’t seem right to put fabric in the printer. It is safe and does not hurt the printer, but do not try this with a laser printer! The first chapter of The Inklingo Handbook gives all the details on how to print on fabric--and the whole chapter is included with the FREE Inklingo Shape Collection. Iron it to the fabric. Find the page with the shapes you want. Put it in the printer and click to print! You can prepare hundreds of hexagons or other shapes in a matter of minutes. When fabric is stabilized with freezer paper, it rolls through a printer without any problem. Almost all jams are caused by the freezer paper separating from the fabric, so if you press with a hot, dry iron on the paper side and the fabric side, jams are rare. Also, did you know that Hewlett Packard actually published a book about printing photos on fabric? All the instructions for preventing the ink from washing out or fading (chemical treatments, heat treatments, pre-treated fabric, etc), gave me the clue that I could print on fabric for Inklingo and the ink would wash away. Ideally, Inklingo quilters want all of the ink to wash out, but if it is okay to leave a thick layer of ink on the fabric for a photo or a label, the tiny amount of ink Inklingoists use could stay in forever, if we wanted, as long as it did not show on the front. Hooray! The problems of printing photos and labels on fabric convinced me that ink jet ink is bad enough to suit my purpose perfectly! The printer manufacturers would rather see us printing photos and using gobs and gobs of ink. Their approach is to keep the price of the printer low and make a profit on the ink. They cannot be thrilled to see that Inklingo uses such fine lines and such a tiny amount of ink. GQP: Are the lines printed in black? Isn’t black ink a problem? 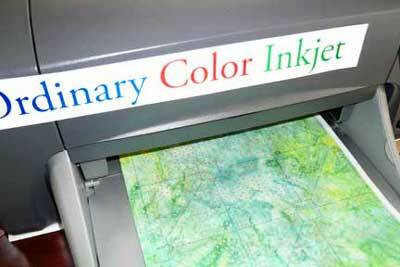 Linda: Black inkjet ink is the most likely to smear or bleed and stay in the fabric, spoiling the appearance. That is why I had to develop the 20 colors to use CMY (cyan, magenta, yellow), but not black (the K in CMYK), and a simple test procedure. 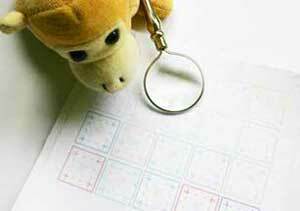 It is easy to satisfy yourself that the ink in YOUR printer will wash out. There is a test page with all 20 Inklingo colors. 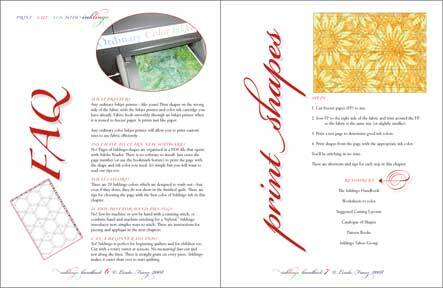 Print it on a small scrap of fabric and rinse it to determine which of the colors wash out completely when printed with your particular inkjet, and which of the 20 colors shows well enough on the wrong side of a particular fabric without showing on the front. The test page also lets you choose the lightest, finest lines that show on a particular fabric, so you can use the least amount of ink, and be sure the lines will wash out. Simple solutions are the best! 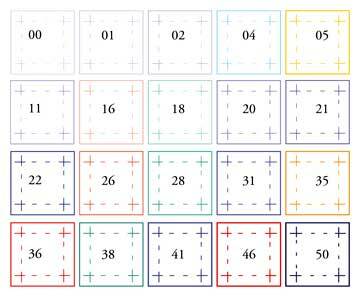 Our interview with Linda Franz concludes with a Shape Collection and Free Printable Quilt Patterns.